So much of our music, video, and digital entertainment is created and produced in Los Angeles. We watch our favorite stars walk the red carpet in LA. In ten years, we will witness a spectacular and sustainable Summer Olympics in LA. Behind the scenes, LA is working towards a rapid transition to renewable energy sources and an electrified mobility system. Los Angeles is evolving from a reliance on dirty central power plants to smart, sustainable and decentralized electricity generation. The transition has happened as the population of LA County has grown from four million in 1950 to over 10 million people today, larger than 41 of the U.S. states, with close to four million living in the City of Los Angeles. In the County, people are sprawled over 4,751 square miles, bigger than most nations. Coal and nuclear power have gone to zero and fifty natural gas (methane) plants are being shut down. During a recent visit to family in LA, the skies were greener than when I grew up in a suburb of LA. Then, children breathed air that was the equivalent of smoking a pack of cigarettes daily. Now, thanks to energy and fuel efficiency, the air is cleaner today. 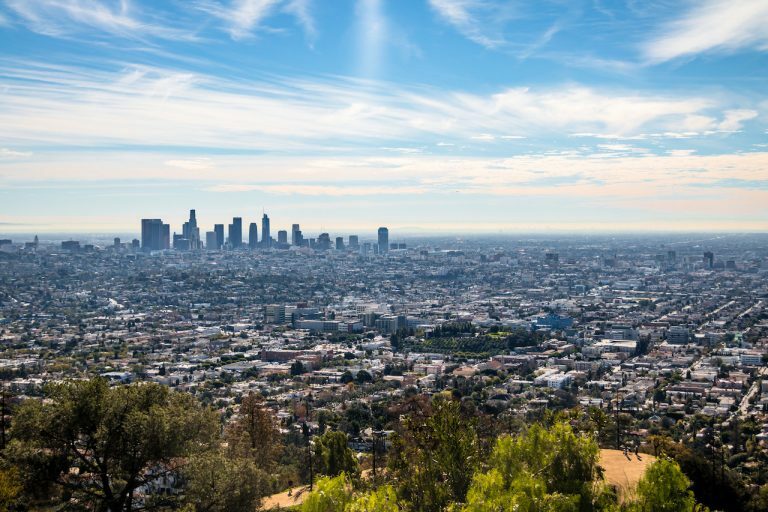 Despite population growth, LA has reduced greenhouse gas emissions 20 percent since 1990. Southern California Edison (SCE), serving 15 million people in the LA area, acted at heroic speed by utility standards. Already challenged with the closing of its last two nuclear reactors, the utility now needed an alternative to dozens of its methane power plants. Due to the lack of methane fuel, SCE will shut down about 30 peaking gas plants. By 2020, it will also shut down a number of larger once-through-water-cooled methane plants because drought has forced California to water efficiency. The massive loss of central generation is successfully being accommodated with renewables, energy-efficient building retrofits, energy pricing, and cloud services that move demand off-peak, and with intelligent energy storage. SCE has contracted for 400 MW of different types of battery and thermal storage at various locations. Impressive is 100 MW of lithium batteries in 40-foot trailers, installed by AES at Alamitos, where several of its methane plants will be retired. Wind and most solar is generated by large projects, often built by operators like NRG and sold to SCE through 20-year power purchase agreements. Solar is typically ground-mounted with an axis that keeps solar panels tilted toward the sun from sunrise to sunset. In addition, solar is generated at thousands of homes, commercial roofs and parking structures. With storage, renewable electricity can be delivered during peak hours as reliably electricity from a traditional power plant. Beyond the massive utility-owned lithium batteries, SCE is working with a number of competitive bid winners that aggregate behind-the-meter storage at SCE customer locations. For example, SCE awarded Stem, an intelligent energy storage aggregator, a contract where 85 MW of behind-meter storage are being deployed for daily demand response, delivering energy from batteries or in using batteries to moderate demand. Customers include Park Place, J.C. Penney, Soka University, John Hancock Offices, and Panasonic. Advanced Microgrid Solutions (AMS) was awarded five power purchase agreements (PPA) to aggregate 40 MW of fast-response storage at customer locations. AMS is currently implementing behind-the-meter storage at 24 Irvine Company buildings, 18 water treatment facilities, and California State University campuses. Today, most SCE power generation is from natural gas (methane). Soon, most of its generation will be from renewable energy such as solar, wind, hydropower and geothermal. With all the current talk about infrastructure, SCE and LA are installing an infrastructure for the future using distributed renewable energy, intelligent management of supply and demand, smart grid, big data, and machine learning. Old central power plants are being replaced with new virtual power plants. While LA is rapidly moving away from natural gas (methane) It’s cars are rapidly shifting from another “gas,” gasoline, to electric mobility using renewables. My dad commuted to LA, crawling on the freeway with all the other cars that only got 10 miles per gallon. Few cared, gas was only 9 cents per gallon at the pump. Now, many take that same commute on LA Metro’s commuter rail that runs on electricity. In turn, the electricity used is increasingly renewables. Electric cars will minimize LA’s biggest source of emissions, but they won’t eliminate gridlock. Traffic congestion is one of the biggest day-to-day challenges for Los Angeles’s residents, with the average person spending 104 hours stuck in traffic each year. The city is forecast to add an additional 500,000 residents over the next two decades, adding stress to roads and highways. To get people moving, LA is investing billions in better transit. Already, 1.4 million commuters use transit instead of driving. LA Metro has added five new rail lines consisting of 82 additional miles of Metro Rail service; and added 22 Bus Rapid Transit Lines, making it perhaps the greatest BRT success in the U.S. When BRT ridership increases, LA Metro has even upgraded lines from BRT to commuter rail. LA Metro is replacing all its 2,400 CNG buses with electric buses that will have massive lithium batteries to provide hundreds of miles of range. LA’s rail is already electric and the electricity is increasingly from solar and wind. As California’s largest city, LA will be an early adopter of ACES mobility – autonomous, connected, electric, and shared. In California, autonomous vehicles are legal, including cars with no steering wheel. Fifty companies are currently testing autonomous car technology, including several headquartered in California such as Tesla, Uber, Lyft, and Alphabet’s Waymo and Waze. Uber plans to start testing urban air taxis in LA in 2020, likely to be named Uber Air; unlikely to be called a flying car. Some of these test air shuttles will likely be battery-electric helicopters using renewable energy. More residents now live car-free in LA, with its ever-expanding Metro transit, Metrolink regional rail, walking, bicycling and ridesharing. Connected apps, such as Google Maps, have helped me take Amtrak from San Francisco to LA Union Station, then easily navigate commuter rail, bus, and walk to destinations, or hail Uber or Lyft for the last miles. In ten years, the Summer Olympics will be hosted by Los Angeles. The 1984 Summer Olympics in LA was impressive. In 2028, LA’s citizens from 115 countries will host athletes from over 200 countries. The Olympics will be a celebration of diversity, innovation and sustainability. For the 2028 Olympics most of the electricity will be from renewable energy. Visitors will use apps to seamlessly navigate between rail, electric buses, and electric autonomous ride sharing cars and shuttles. No worries about missing that gold medal event that cost you $800. Just open your Uber app and click Air. Just make sure that the security drones have your vehicle coded “friendly” in their database. The world will witness smart energy for a smart city.